During my recent stateside mini-tour I delivered a couple of sessions at the CEFPI World Conference for leading school design, in San Jose (got the highest feedback rating for all speakers—whoop whoop) plus an internal masterclass in Santa Monica for DLR Group, a school design architectural firm. Social media augments and embellishes your current operations. It’s a tool (or a set of) to not only save time and money but also to enable practitioners build better learning spaces. Conversations drive social media spaces. Of course I would be featuring and talking about our own designs and the process relating to them, but the blog would also feature stuff like makeuseof.com’s: The 6 Best Blogs For Architectural & Interior Design Ideas and picocool.com’s: Architecture resource to broaden the debate and inform myself and others that there are more examples of innovation outside the industry than in it . During the previous mentioned sessions I also showed the participants many online conversations about their specific school designs which none of them knew about. Highlighted how architectural students, studying today, were featuring and discussing the agencies work on their own study blogs. How random people were taking photos of their buildings and adding them to related learning environment groups on Flickr. Illustrating that students were making videos about their learning spaces. This video from the UTSA College of Architecture on Why My School Rocks illustrates the point perfectly. All online. Transparent. Sharable. With lots of opportunities for conversation and engagement (through the commenting functions of these spaces). Again, from talking with many industry folk hardly any of them are using platforms such as Google Docs, Skype, Wikis, internal / private blogs (as digital scrapbooks or team development spaces) etc. All potential collaborative spaces to work more effectively. (Maybe I should’ve just embedded this video as the whole blog post and be done with it). The end users of the school design process have the means and mechanisms to communicate their thoughts and create content globally and instantly. They can access vast amounts of information through devices they have in their pockets and it’s only going to get more ubiquitous, cheaper and quicker. That’s the line in the sand. That’s your starting point. That’s the challenge. We can all agree that not including the end users (students) in the design process is bonkers (what, in my old youth work days, they called ‘participation’ and which we now call conversation), this blog post does not argue this case as most school design agencies are all over it. Instead it’s more a rallying cry around the emergence and continual shift social spaces and technology now offers. An ever moving target for school designers to lock their targets on. We’ve already seem some noticeable adoptees : universities are using geo-location apps to better acquiant new students to their campus, Bill and Melinda Gates Foundation getting involved in prepare high school students for college. The biggest takeaway from the recent stateside sessions was a school design architect saying : “wouldn’t it be cool if we blogged the whole process of designing and building a school, like every bit of it”—YES IT WOULD but more importantly why wouldn’t you?!?!? 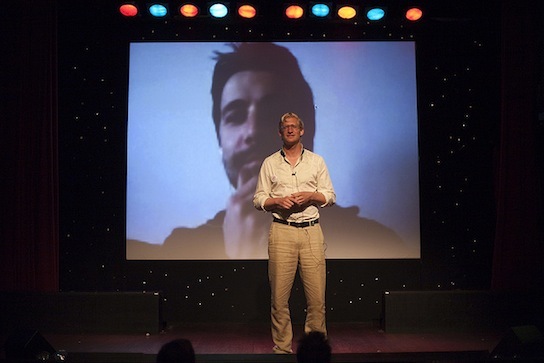 Here I am speaking via skype at the TEDxAmsterdam event back in July 2010. I was invited by Pim Betist (the more handsome chap in the photo) to suggest and introduce my favourite TED talk which was then played (it was Simon Sinek and his Start With Why talk which has had a huge impact on us). The opportunity arose after Pim tweeted out the day before that he was looking for anyone to fulfil this request—I basically put my digital handup with a reply as was free. Pim and I met at the Trends In Kids and Youth Marketing conference in Amsterdam where we both spoke. I also did a vodcast with him about his funky company Africa Unsigned. Got the conference gig after Ab Kujer suggested me as a speaker plus the agency exploring booking me read our little publication Zen And The Heart Of Social Media. Ab runs Junior Senior whom we’ve done a little work with (and who’s just about to publish his first book, Think Small, Grow Big). Ab first contacted me after seeing our MediaSnackers explained video years ago and we’ve stayed in contact since forming a great friendship over these past couple of years. The digital world is overlapping the real world, offering us loads of digital breadcrumbs to follow and creating opportunities to connect to others like no other time in our history. We get asked a lot of questions about social media. Most of them are simply reframed to refocus the thought and to enable a new approach in thinking. What’s the ROI of spending time on social networks? What does a good social media policy look like? Have you got any examples related to my industry? How does social media usage differ from B2C to B2B? How much time do I need to set aside to play around with these new websites as I’ve got a job to do? What’s the ROI of connecting with existing customers / clients (or even potential ones)? Do we know enough about social media to create a policy around its use yet? Have you got any models which can be adapted and adopted? How does social media enable me to connect with the specific people in businesses/organisations/communities who buy our products/services? How much time do we invest in developing our professional learning to ensure we keep up to date with new developments in our field? Feel free to ‘borrow’ the above to reframe the questions usually asked in internal meetings about social media investments and let us know how you get on. Any other questions which are in need of repositioning you can think of? A couple of weeks ago I was humbly delivering a session to a group of students at the Foundation for International Education—the international class has the fantastic title of “Creative Leadership and Innovation in UK Media” and I was sharing what we do with our clients plus offering other hopefully insightful stuff. To inspire people to learn, work & live differently. Stuff like this reinforces that focus and makes us work all the more harder to get better at it. How do you get your motivation shot? Over the years I’ve been teaching I’ve always sought out guest speakers to help students get a feel for the “real world”. Although almost all guest speakers can provide some real world information, it’s the rare guest speaker that truly inspires the students, gets them charged up about the topic and engages them to learn more. But that’s what you did! You can see from the feedback cards that you accomplished each of those goals. “DK was amazing” “I loved listening to DK” “I never thought about social media the way DK talked about it.”—those are just some of the sentiments. Your energy and enthusiasm for the topic are a given. But it’s your knowledge and experience, your willingness to share personal experiences, and your understanding of how social media fits within the goals of a company or organization that made the learning truly worthwhile. Thank you for the opportunity to come and deliver and for your energy in the session guys, means a lot. A big thank you to Kyoo Slides for creating the above and for illustrating how easy all this social media stuff can be. We spend a lot of our time deconstructing the reasons, the semantics, the needs and strategies behind social media use for our clients, and most of it comes down the five points made above (which could be boiled down into the one golden rule of social media use).